Find and compare the best prices from a range of well known car rental companies at Izmir Airport. This is a free to use facility, enabeling you to book direct with the company quoting the price. 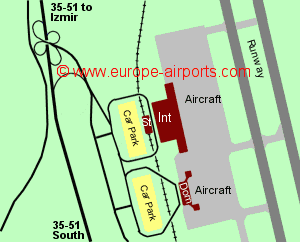 Izmir airport has separate international (opened in 2006) and domestic terminals approximately 250m apart (connected by a walkway). The domestic terminal was rebuilt and re-opened in 2014 after being closed for 2 years. 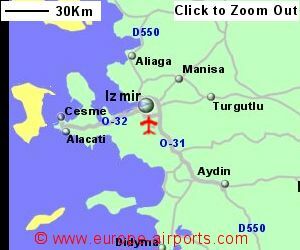 A commuter train service (IZBAN), opened in 2010, links the airport with Izmir city. There is a train station opposite the International Terminal building although the train service is reported to not be particularly frequent. It is however a through line, going both north and south. A shuttle bus connects the airport with Izmir city centre at a cost of 15 Lira (approximately 3.50 Pounds). Facilities in the International Terminal include 12 cafes/bars/restaurants, a selection of shops, a bank, 3 currency exchange facilities, executive lounge, luggage lockers, and WiFi Internet access. Izmir Adnam Menderes airport has Airport Carbon Accreditation, at the Neutrality level. 12.8 million passengers passed through Izmir airport in 2017, an increse of 6% from the previous year.